Even though I still haven't got around to finishing my posting about my travels in Japan, I have got around to making good use of the craft items I bought. Well what I managed to find anyways! As it happens I decided to leave my epic fabric shopping spree until the end of my trip so that I would not have to lug it on the shinkansen to and fro Kyoto, however what I forgot to factor in is that Japan celebrates the new year until 5th January. Given that I was there over Christmas and New Year's, and was going back to Bangkok on the 5th, you've probably guessed it at this point but everything in the famous nippori fabric town was closed. I stepped off the train, boyfriend in tow to snap a picture of me in front of the nippori fabric town sign so I could tell you all about it. But as I arrived to the main shopping strip everything was closed, and even with my limited Japanese I knew that the signs on the shops were indicating they were closed until the 4th or 5th or even 6th. Even my boyfriend felt sorry for me, after much debate about whether the signs said close to the 4th or opened on the forth, he encouraged me to go back the next day and check it out, just in case - about two shops were open, it was kind of worth it though. But I was thoroughly depressed after peeking into the beautiful shop fronts full of fabric, and cheap 500yen signs wahhhhh...anyways I did managed to get some good stuff which leads me to my current tutorial. Whilst in Japan, I did manage to find some interesting craft books, one of which was one the French art of Le Cartonnage. According to Google, it's the craft of using cardboard and fabric to create things, simple enough right? Well in the book I bought, it ups Cartonnage a notch or two using paper milk cartons for cardboard, basically making it the best upcycle ever. This was created straight from the book, and it was simple enough - but given my poor cutting and gluing skills, coupled with my impatience, I ended up with hot glue gun stringy bits all over my clothes. After yesterday's success I decided to give my own version ago. In the theme of organising my messes around the house, I decided that my dresser and make-up was next, so keep reading for this make-up holder upcycle milk carton tutorial. WHAT YOU'LL NEED - so normally I give you very clear instructions with lots of pictures but I didn't particularly want to take pictures with glue-y fingers, so pardon the lack of photos and poor paint drawings. Also I tend to give very detailed what you'll need lists, but with this it really depends on the size of your milk/ juice cartons. Please refer to the diagram below, it will be a lot less confusing for your sake, my words and instructions are confusing to me sometimes. 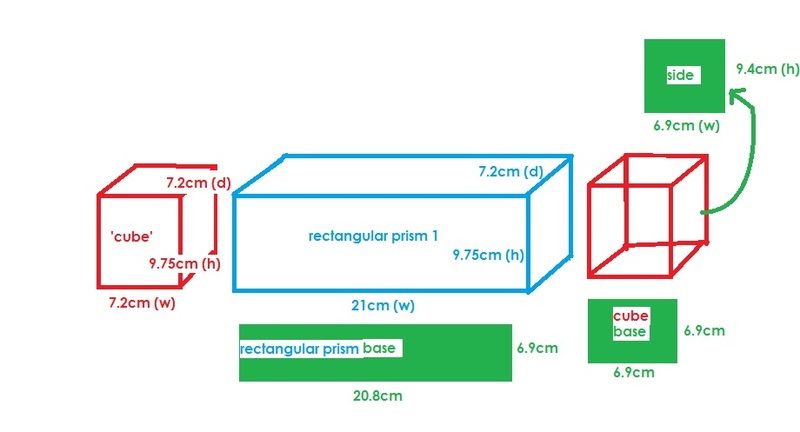 The basic structure of the makeup holder will be 2 identical 'cubes' which are shown in red, and 1 main rectangular prism. You will basically need to cut a copy of all the sides of the prism + 'cubes' to line with fabric to give the cartonnage make-up holder the professional look.There's an actual photo if you scroll down a bit which makes more sense. Probably best to read this tutorial all the way through twice as it is a bit all over the place. sorry! If you have reached this part of the tutorial then you are doing amazing, and it hopefully means that I haven't confused you - yet. This is the fun part - promise. First, grab the top half of 4 cartons which you have already split. You want ones that are hollow on both sides. Press the carton pieces flat and cut along 1 of the seams - probably with scissors and not a craft knife, as you want to open your carton piece out so you have 4 panels. Do this with both cartons. Tape together the two panels along the cut seams so you have 8 continuous panels. Bend the panels so that it becomes a 3 panel x 1 panel rectangular prism. Tape the panels so that the white part is facing outside, otherwise when you go to put your fabric on, you lovely carton label will show through! Grab 1 of the rectangular prism bases and tape it to the bottom of you rectangular prism. Put aside your rectangular prism, and grab the 2 other carton halves which have been split into panels. You will only need three panels to line each side - cut off the extra panel - this can be used/ salvaged as a side rectangle. Ok so I lied, but now you know which pieces are what, so here's the fun part where you get to play with glue and fabric. I like to start with the lining pieces first - just because there is so much more of them and I'm a rebel like that doing the inside first. Grab you rectangular prism side panels and place some glue on the plain side, press this down into its corresponding lining fabric. Grab some newspaper to line whatever surface you're working on because this will get messy - and heat up your glue gun. This is where my hands got all hot glue gun stringy so no pictures just words. or you could use your fingers to fold the fabric onto the line of glue - but I get scared of burning my fingers. Wrap all your lining fabric pieces around the respective cardboard pieces. Wrap the outer fabric pieces around all the INDIVIDUAL cardboard pieces so don't wrap the prism or the 2 'cubes'. When wrapping the prism make sure that the raw edges of the fabric end up on the side of the prism, as we will be gluing the 'cubes' to both sides to cover it up. Same as before run a line of glue and fold, run a line of glue and fold. Do this for both the cubes. Grab the bases for the cubes and prism. Get the hot glue gun and quickly outline the base with glue, however don't place the glue too close to the edge of the piece, or it will squeeze out when you adhere it to the base of your cube/prism. Grab the lining pieces and using the same method of outlining the pieces with glue, not too close to the edge and quickly pressing in place until all the pieces have been adhered. Grab the piece for the lid and the remaining 'cube' base. Glue a folded piece of ribbon to the base. Then glue this to the lid. Yay you will now be the proud owner of a upcycled milk carton makeup/ pencil/ knick-knack holder! Okay so that was a pretty complex tutorial to write as I didn't have any pictures and I tend to scroll through tutorials with lots of words as they confuse me. So if you have any questions please leave a comment as I'd love for all of you to try this. As a side note I don't actually drink soy milk (family does) unless it's a chai latte, but I have a feeling that the paper milk cartons with the plastic tabs are cleaner, as the cartons you tear at the nib absorb some of the contents of the carton and tend to smell a bit more even after washing. I really love your tutorial! 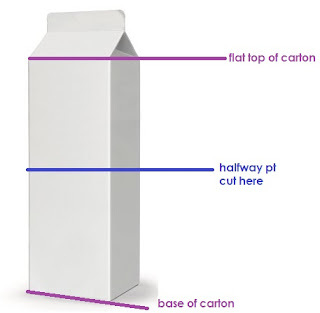 I was wondering will it be possible to use one of your images (the diagram showing where to cut the carton,) for my GCSE project? thank you keep up the great work! I would be happy for you to use the images for your GCSE project. What kind of project are you doing? Its an upcycling project and I loved your idea! Thank you.